With the holidays being just around the corner, many people in the marketing world tend to get excited while simultaneously feeling overwhelmed by the endless amount of opportunities that come along with it. There are so many possibilities when it comes to marketing campaigns during the holiday season that it seems silly not to take advantage. With the unlimited opportunities that come pouring in during the holidays for marketers throughout the world, it can be difficult to pinpoint the exact direction you want to go in when it comes to your campaigns. You can send out a great holiday themed advertisement or you can take it one step further and blast out a coupon to your loyal customers in honor of the holiday season. You can even go the simple route and share good tidings and cheer! The real question, though, is which direction should you go in? How should one go about spreading the joy that comes along with the most wonderful time of the year? The answer is simple: MMS campaigns! Catch customer bases’ eyes with beautifully designed graphics that will get your message across in the most effective way possible. And the best part? We at Lime Cellular made it as easy as possible to send out the perfect MMS holiday-themed campaigns by providing you with amazing graphics that you can use at your discretion! 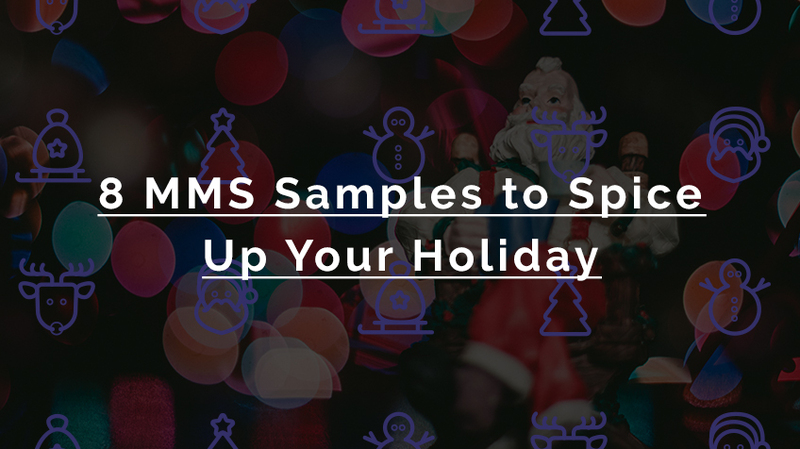 Here are 8 samples of MMS holiday marketing campaigns that you can use. 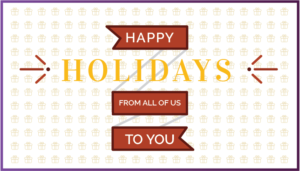 A simple happy holiday will show customers that your business appreciates them. Not only will an MMS message like this spread good cheer, but it will also remind all audiences to come by and support the business that sent it out. With 2017 being right around the corner, nothing seems more appropriate than a happy new year themed MMS message. Similarly to the happy holiday SMS, this kind of message will bring awareness and traffic to any business. Taking it one step further when it comes to your holiday MMS campaign can bring in much bigger crowds. 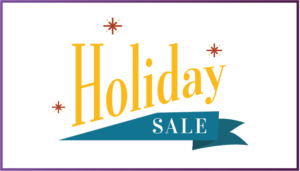 This holiday sale MMS would be great for a retail store to blast out in order to spread the word to their customers about a store wide discount special for the holiday season. 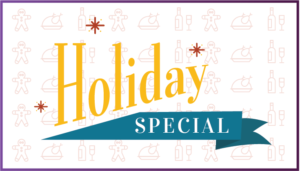 This MMS sample would be perfect for any and all restaurants in order to promote their holiday-themed specials. Spread the word about the seasonal specialty dish in your restaurant or the holiday lunch special that’s only available for a short time. This sample is truly universal in the world of food service! We are all aware that this is the time to be jolly, but there’s more to it than that. 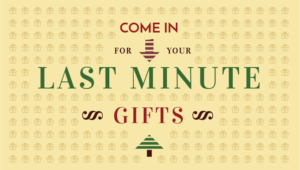 It is also the time to buy presents! 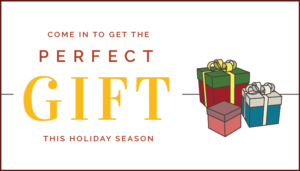 Sending your customers a reminder that your store can provide them with much needed help in the gift purchasing department will do wonders in picking up the pace during the holiday season. Sending out an MMS like this one will remind customers that your business is here for them in their time of need. So many people push off purchasing gifts to the last minute during the holiday season and now is the time to take advantage of that. Let customers know that you’re there to help them in any way possible. Nothing screams holiday marketing like catchy phrases and slogans. 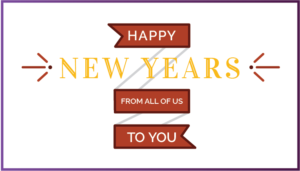 Try this one on for size once we ring in the new year. 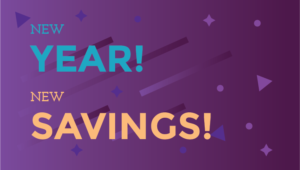 This MMS will definitely bring in some customers and boost your business so you can start off the new year right! At the end of the day, the holiday season will boost retail sales at any given business, regardless of what they are selling. 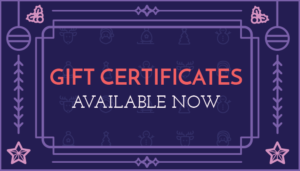 The easiest and most universal gift of all will always be a gift certificate. This MMS graphic will appeal to the indecisive shoppers that just can’t make up their minds. And the best part? You don’t have to wrap it! 14-Day free trial - No obligation!